Let your chic and streamlined street style into your shred wardrobe this season with the Burton Southside Slim. Featuring monochromatic colorblocking to bring modern day accents to a classic cut, the Southside is a slim fitting chino-esque pant, with the unbeatable protection of Burton 10k waterproofing. DryRide Ultrashell that's just as durable as you are stops powder spray and slushy slop dead in their tracks, while mesh-lined zip vents allow you to customize your warmth. Comfort you deserve without sacrificing the performance you need. is this short, regular, or tall? BEST ANSWER: It is a pretty skinny fit rather than slim, but they stretch pretty well. I'd say they are a regular-tall, in the middle length there. The string lacing helps really well on holding the pants up. Still riding in them, very good flex and waterproofing. I don't get cold even with just these pants on. Plan on getting a wider fit soon. Recommended. thanks Peter! it sounds like i'd actually best fit a L, but i found an XL for $140cdn so i'm hoping they're fitted enough that i can do a simple cinch to on 'em. Thanks again! cheers Brent - i'm 6'4", 200lbs, and the House vid on the pants were super helpful - ordered the Mid XL off another site, but if they're too big i'll come back here for the Slims - i'm ok with the fittedness so we'll see how the mid's fit. thx again brother. It looks like you got your answer but this will be the regular inseam. Do the back pockets close with velcro? BEST ANSWER: The pocket flap has two small separate pieces of Velcro to hold the corners down, however is secured by a snap button in the center. Yes, two pieces of velcro. They are pretty secure. I wouldn't put my wallet back there while riding but that's just me. Yes, they do close with velcro on the back. new Q - tried the XL and they are huuuuuge on my 33" waist - do i need to be dropping to a medium with a baselayer to keep these things from falling off my pooper, or is large ok?? BEST ANSWER: If you haven't already, take a second to look at the Sizing & Fit link that is located above the red Add to Cart button. 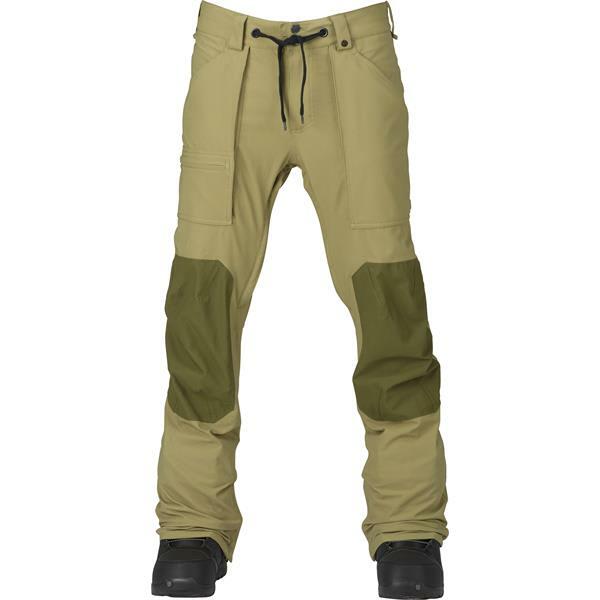 The sizing chart will help you select the Burton Southside pants size you need with your specific measurements. By the looks of the size chart your 33" waist fits best in the medium size pants (32-34"). Is there any way I can get a medium? Which color option are you looking at?